It’s not just the owners of a building that are responsible for upholding fire safety, and “ignorance is not bliss” when it comes to fire safety responsibilities, says Kizzy Augustin, Partner at Russell-Cooke. 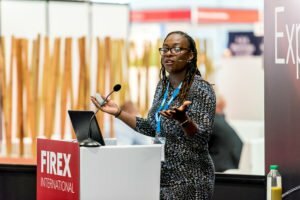 Speaking at FIREX International, Augustin considered the legal ramifications of the Grenfell fire, and what it could mean for future fire safety prosecutions. The Grenfell Tower fire occurred just a year after a refurbishment of the bottom four floors and Augustin stressed the importance of duty holders being aware of their responsibilities. She listed questions about how the duty holders acted: were residents of Grenfell heard when they complained about certain aspects of fire safety? Were fire authority regulators right to give the tower a medium risk rating? Did those carrying out the refurbishment fulfil all their responsibilities? These questions, she said, will be answered in the inquest and any subsequent prosecution, but her point was that “It’s very important for every duty holder within an organisation to know what their responsibilities are. At the moment there are “very few prosecutions” brought under Section 6 of the Health & Safety Act, which says that anyone supplying or installing has a duty to ensure that whatever they are supplying is installed in a way that doesn’t cause harm to the people that use it. Enforcement, says Augustin, could see huge fines based on the new sentencing guidelines introduced in 2016. “At the moment fire authorities are exempt from the sentencing guidelines because they felt that they have enough sentencing powers to sentence suitably. I think post-Grenfell that will change. Most fires will fall into the top category when establishing a risk of harm, as there is always a risk of death in a tower block fire. For a large organisation (one with a turnover of over £50 million), a Category A offence will have a starting point of a £4 million fine. “Most duty holders won’t be comfortable with this sort of fine, but this is the regime that might well be adopted post-Grenfell. The contrast is seen when comparing a similar fire and another offence tried more recently. The Lakanal House fire spread through a number of flats in a South London block in July 2009, killing six residents and injuring at least 20 more. Southwark Council was given a £270,000 fine after pleading guilty to four charges of breaching safety regulations. Haslington Hall in Cheshire, meanwhile, was the subject of a prosecution carried out several weeks ago. There the owner of the listed building, which was used as a wedding venue, was jailed for 20 months for his failure to take general fire precautions. Grenfell could spark more prosecutions for extended duty holders It’s not just the owners of a building that are responsible for upholding fire safety, and “ignorance is not bliss” when it comes to fire safety responsibilities, says Kizzy Augustin, Partner at Russell-Cooke. If I was CDM Coordinator on this project I would be feeling quite scared now. I wouldn’t. On the face of it (given the scarcity of detail in news reports) this looks like a case of “value engineering” gone wrong. It was common practice under CDM2007 for Principal Contractors to “value engineer” finished designs without informing the CDM-C of these “design changes during construction”. Replacing fire resistant cladding with its flammable equivalent would be a “no-brainer” for someone looking to minimise costs. The question also has to asked, given that new buildings are required to have water sprinklers fitted, then why did the government in power at the time of these changes decide that existing buildings were exempt from the change. Interestingly this was the Labour Government of Brown and Blair. Putting cost savings first were they. Clearly both should be hanging from a rope. I feel there is still along way to go in designers and Clients understanding their duties to meet CDM. Also who what is the old CDM C the new Principal Designer. Kept in the dark most of the time!